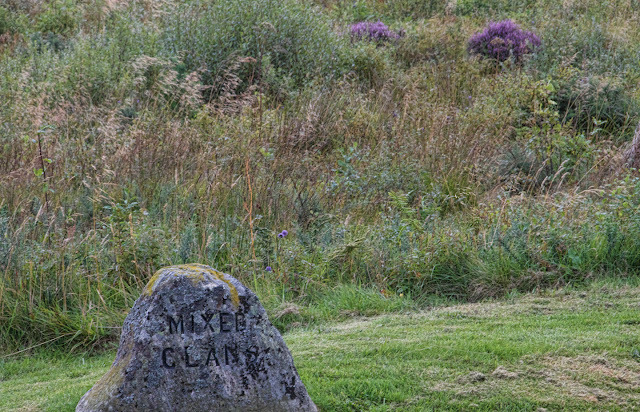 The battlefield at Culloden -- site of the defeat of the Jacobite rebels in 1746, the last battle fought on British soil -- is less than an hour by bus from Inverness. The good weather having fled, probably for good, it was windy and chilly, with unenthusiastic, off-and-on rain, but the moody skies were much more appropriate to such a a sad, bloody place than bright sunshine would have been. There's a very good visitor's centre that explains the background as well as the logistics of the battle. It wasn't just Catholic Highlanders versus the Protestant English, and where you stood on the Divine Right of Kings not to be deposed as the Stuarts had been; many of the Jacobites were Protestant as well (though Presbyterian rather than Anglican), and many Scots, both Lowlander and Highlander, supported King George over the Bonnie Prince. England's ongoing issues with the French contributed as well; Charles Stuart spent much of his time before landing in Scotland trying to persuade the French to invade. The rebels were undefeated; they had taken Edinburgh and almost taken London before -- inexplicably -- turning back. But bad luck and bad decisions brought them here, to a marshy moor on a brutally cold windy day, with an ill-provisioned army that had neither eaten nor slept facing English cannon. It was over in less than an hour. The aftermath was brutal; the wounded were bayonetted where they lay. Those who could stand were shot. And the Highland way of life was over, with even the wearing of tartan outlawed. Today it's a wide moor surrounded by farms, covered in shrubs and heather, with little sign of its tragic history except for the headstones marking the mass graves of those who died there.